For anyone that has paddled a kayak deep into the wilderness only you can truly appreciate the sense of perspective and solitude that it allows. If anything I only wish that I discovered this earlier but it will be something that I will pursue for the rest of my life. The opportunities for nature photography are without limit and often one will witness those special moments, whether it be a sunset on a remote beach, the sounds of Humpback Whales coming up for air as you sleep or Pacific White sided Dolphins escorting you and your kayak to safe haven. 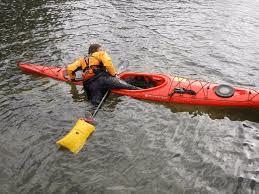 The area surrounding Vancouver Island and coastal British Columbia is said to offer some of the best sea kayaking in the World and I plan to explore as much of it as I can. Tonight I successfully completed lesson 1 of 3 towards my Paddle Canada certification and though very basic training I learned a lot about self and assisted rescues. Much thanks to the staff at Comox Valley Kayaks as always for their knowledge and expertise. Self rescue using a paddle float. I didn’t know that these paddle floats existed prior to my lesson tonight. I’ll definitely be purchasing one at Comox Valley Kayaks.